🌟 This book was listed by many as a Fantasy book and not pure Historical fiction. I know that historical fictions don’t work for me and I stopped reading them a long time ago. I have never seen a book in this genre getting this much hype so I thought that it must be special. Nothing was special about it and I don’t think it is a fantasy book at all. 🌟 I DNFed this after 41 chapters because I didn’t feel I was enjoying it and I felt like I was forced to read it. It brought me back to high school days were I had to study History although I hated it. I promised myself to enjoy books this year and to not feel forced to read anything and that was that and I did not finish it. 🌟 The book started out good and I thought it had potential and I could see why it has such a large fan base. But after like 25-30% it was being even more slow, boring and nothing was happening. The characters were not interesting and I could not relate to them. I felt when Mohamed was introduced, he became the center of attention in a very annoying way (First book to feature my name and my heart is broken). I did not feel intrigued enough to finish the book, let alone a whole trilogy. I am not so sad that I read this because I have been willing to for ages! now my TBR has fewer books so it’s a win-win situation. 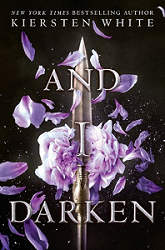 🌟 I am going to keep this short and summarize here: This book has a good writing style, I felt it was slow, boring and I couldn’t relate to the characters, but that’s me with every historical book ever, so I may be biased and I am definitely not the best judge. If you love historical fiction then this is good, if you think this will have fantasy elements then stay away and just don’t think about it. 🌟 Prescription: I can only prescribe this for Historical fiction fans!